This past weekend, the 314th Fighter Squadron at Holloman AFB (HAFB), New Mexico, graduated 17 young men into the front line ranks of the Air Force’s top fighter squadrons stationed all over the globe. HAFB is adjacent to the famous White Sands Missile Range. Still framed shot above is by Lt. Aaron “Stroke” Gibson, F-16 Student Pilot Graduate. To see the Class’ Official 5:00 minute long Video, which was created by Lt. Gibson, simply click on this Photo and the 5 Minute Video will start up on YouTube. Make sure your sound is turned on. Watching this Video will give the viewer an insight into the daily sights and sounds typically experienced by today’s Air Force student pilots as they undergo their Basic Jet Fighter Training and qualification in the F-16 Fighting Falcon. 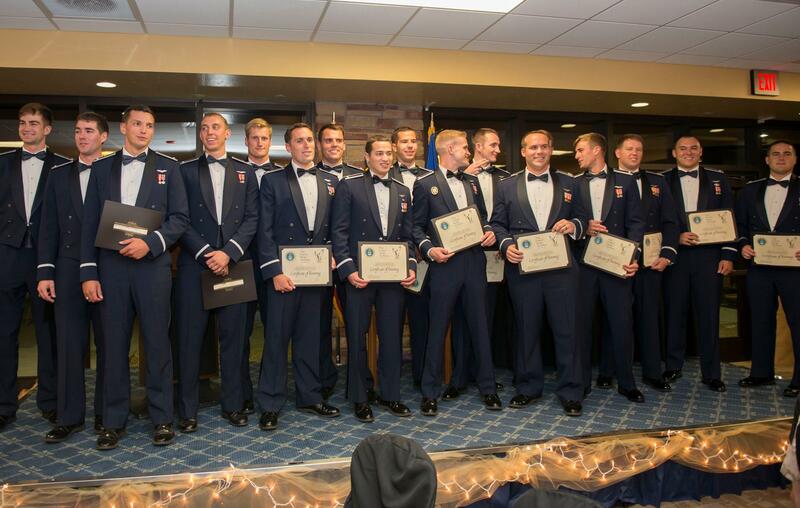 All 17 Graduating F-16 Fighter Pilots of Class 15-BBH* with Diplomas proudly in hand. Photo taken by A1C Randahl Jenson of the HAFB Public Affairs Office. His other photos in this story are credited as “AF Photo.” The other photos are courtesy of the FASF Aerodrome staff. As usual, to see the full resolution of any photo, simply click on it. *[This is the meaning of the Class’ Acronym Title “15-BBH:” “15” represents the year this class commenced training: 2015, and the 1st “B” means this was the second class of that year; the second “B” stands for Basic Training; and the final “H” is for Holloman AFB]. 1: Because four of our active FASF members had a role in this 15-BBH graduation ceremony and, because each of them is also an active member of the El Paso, Texas, FLIGHT 24 of the U.S. Military Aviator Fraternity, the Daedalians (an organization formed by World War I pilots some years after the end of that conflict’s hostilities). 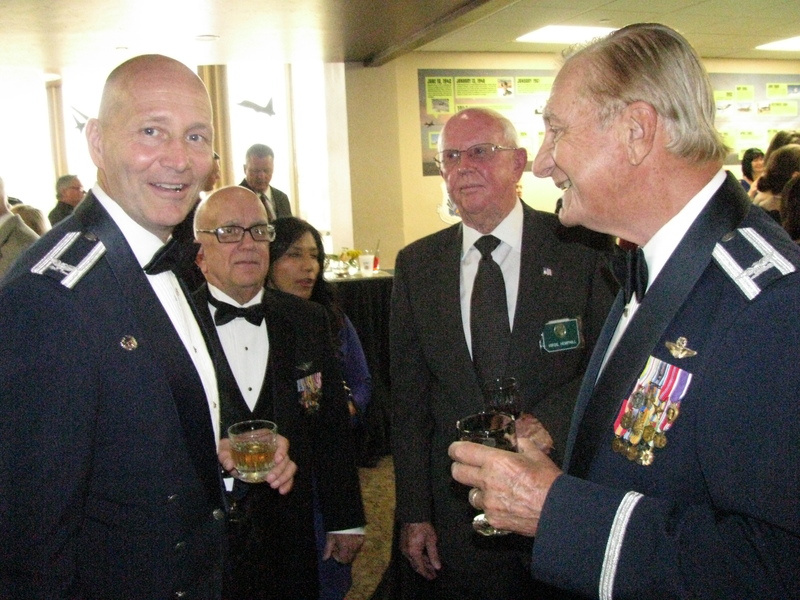 All four are also former USAF pilots and one of them, Roger Nichols, is the son of the Flight’s honored namesake, Major General Frank A. Nichols, a highly decorated Air Force pilot and ACE who flew combat throughout WWII and later served in high ranking command positions in both Korea and Vietnam. 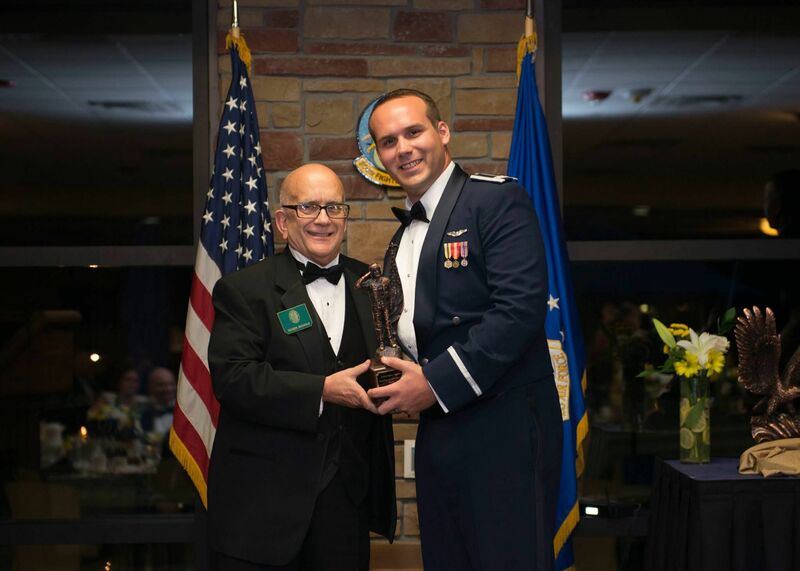 2: Because it has become a tradition that the Daedalian Flight 24, with its many FASF members, award an outstanding leadership achievement trophy to one of the top Student Pilots of each graduating class of the 314th Fighter Squadron at Holloman Air Force Base. 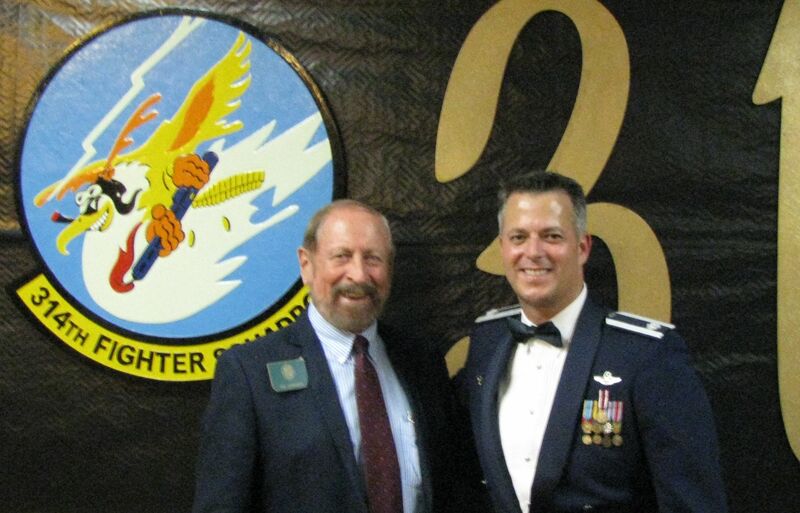 Furthermore, this graduation event provides an insight, by way of these posted photos and especially the short video, into our current USAF operations, particularly in respect to one of its vital defense training programs. It is good to remember that the 1st Aero Squadron’s ubiquitous Jenny biplane was tested and proven as a stable enough aeroplane that it could be – and was – put into mass production in order to be used to train pilots for WWI. The First Aero’s Jenny would be used to train more than 20,000 young men to become Army Air Service pilots, destined to fight – and too often perish – in the skies over Europe in WWI. 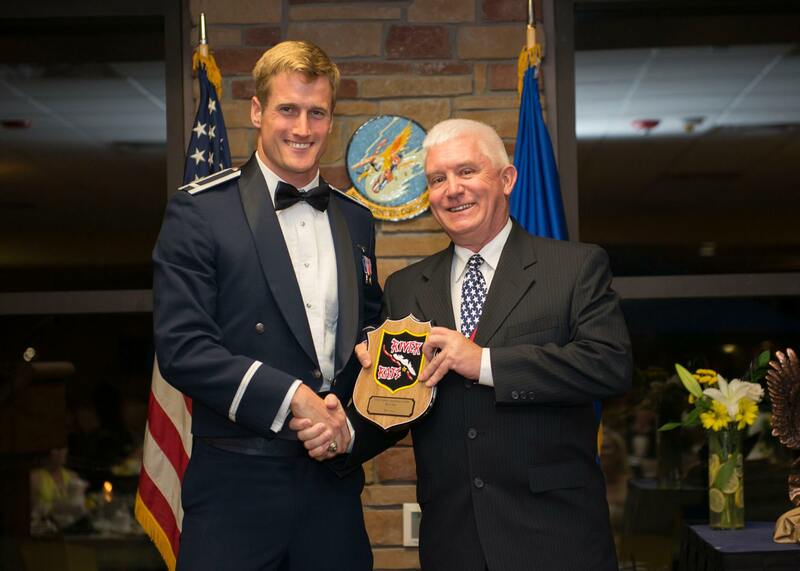 Above: Air Force veteran and former pilot, Roger Nichols, son of the Daedalian Flight 24’s namesake, presents the special Daedalian Leadership Award to Captain Graeme “Pug” Ross. AF Photo. 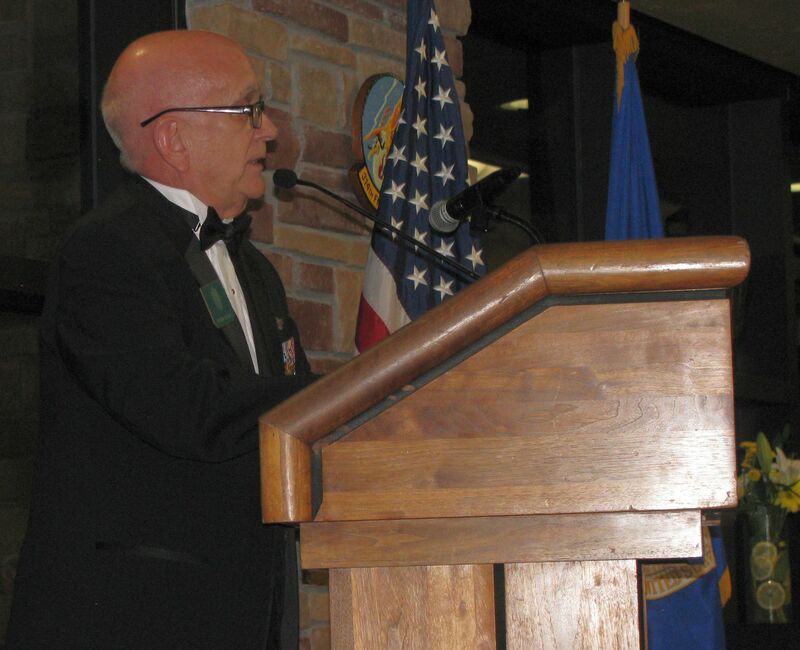 Roger Nichols describes the Order of Daedalians‘ history and also that of his own Air Force Ace Fighter Pilot father, Major General Frank A. Nichols, to the audience. 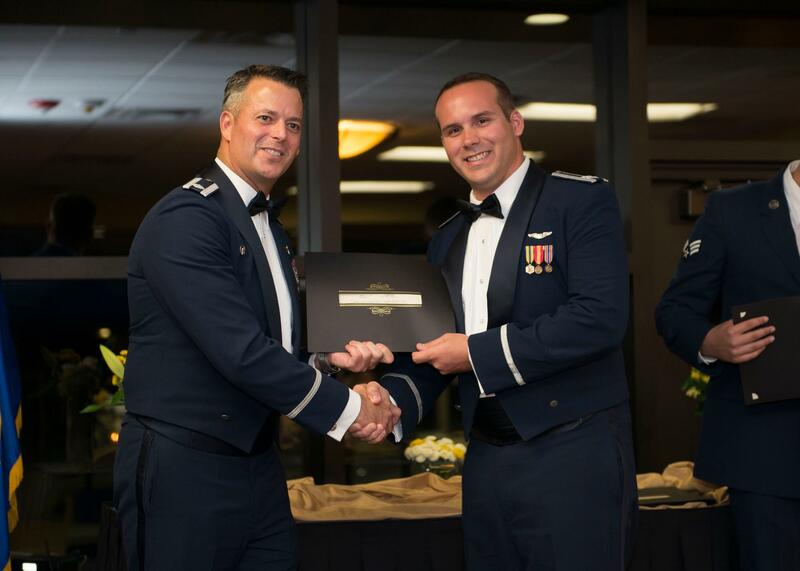 314th Fighter Squadron Commander, Lieutenant Colonel Andrew “Finch” Caggiano, presents his Graduation Certificate to Captain “Pug” Ross, recipient of the Daedalian Leadership Award. AF Photo. Another special Award Recipient among the graduates was Lt. Logan “Pacman” Mitchell. This trophy is called the “Warrior” Award and also entitled the “River Rats” achievement, a name arising from the Vietnam era conflict and given to the the student voted the one the other pilots would most want to have fly (protectively) on their wing. Presenting the trophy is former USAF Lt. Colonel and F-4 fighter pilot, Miles “Cowboy” Crowell. AF Photo. L to R above sharing war stories are: Colonel Jeff Jenssen of the 54th Fighter Group and Daedalians: Roger Nichols, Virg Hemphill, and Colonel Bob Pitt. Immediately behind Nichols is his guest, Olivia Callahan. 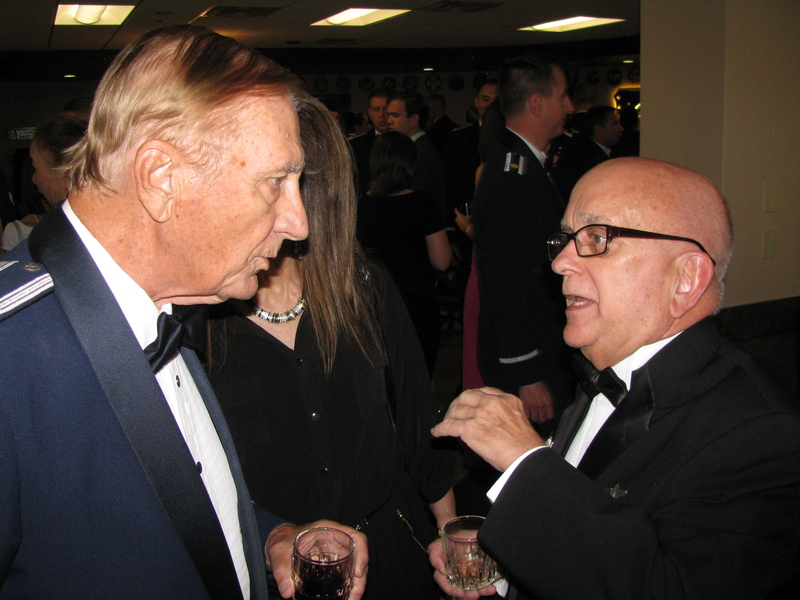 L to R above: Daedalians Colonel Bob Pitt and Roger Nichols engaged in an animated discussion. L to R above: 314th’s Commanding Officer (“CO”), Lt. 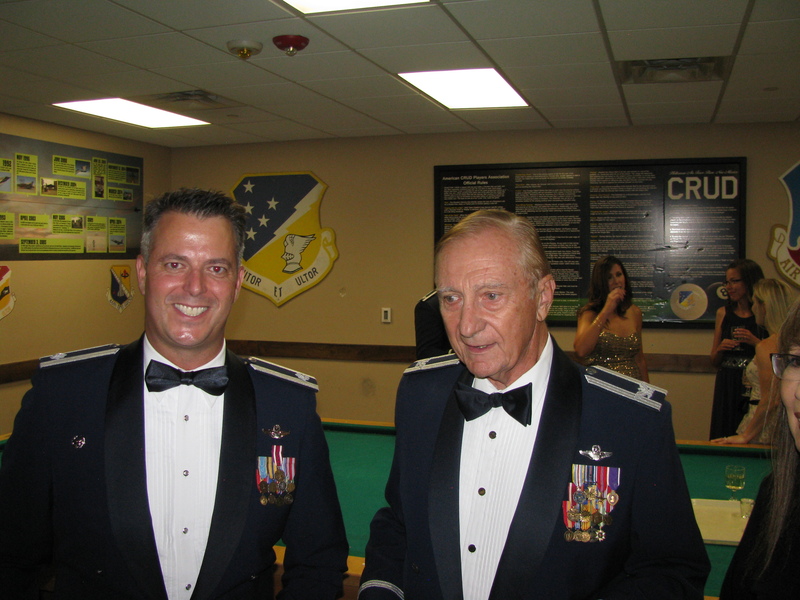 Colonel Andrew “Finch” Caggiano and Colonel Bob Pitt. 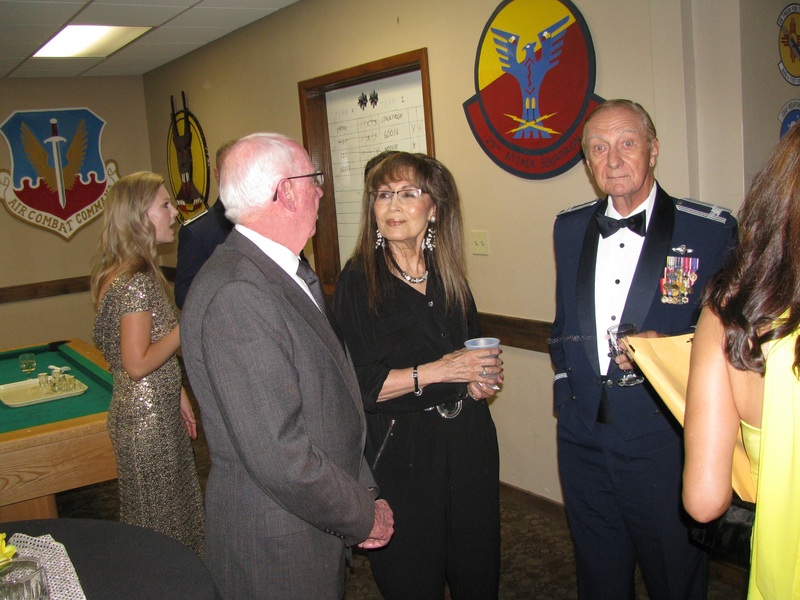 Above L to R: Daedalian Virg Hemphill, Mrs. Julie Pitt and Colonel Bob Pitt. 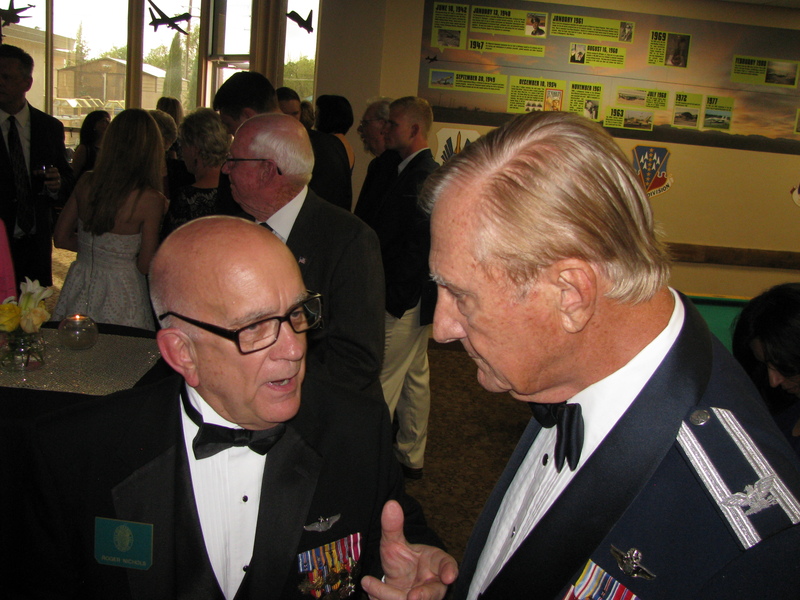 Above L to R: Roger Nichols and Colonel Bob Pitt. 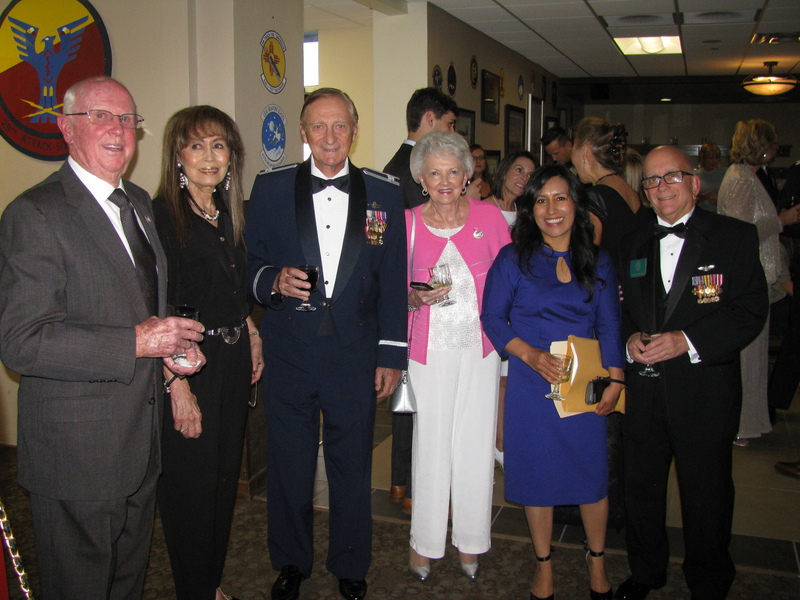 Above L to R: Virg Hemphill, Mrs. Julie Pitt, Col. Bob Pitt, Mrs. Jenine Hemphill, Olivia Callahan and Roger Nichols. 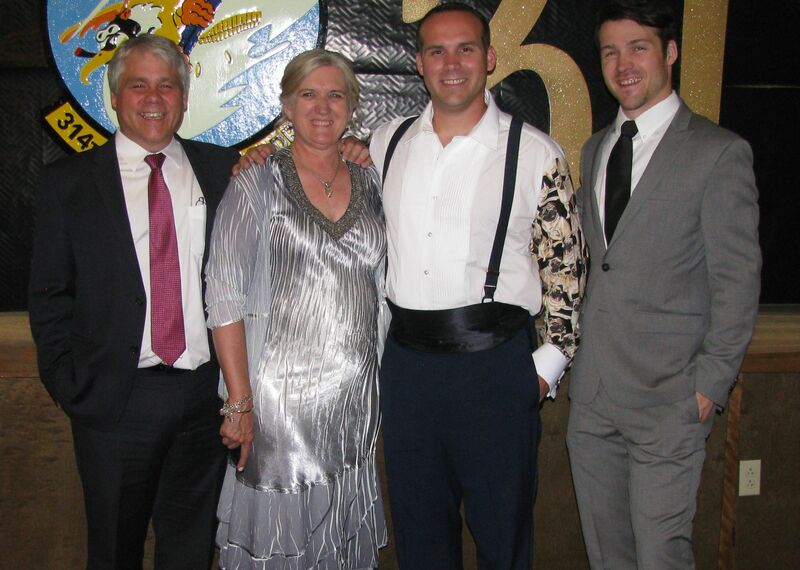 Above L to R: Dr. David Ross, Mrs. Linda Ross, Capt. Graeme “Pug” Ross, and his brother, Brendan. Captain Ross had earlier been awarded the Class Daedalian “Leadership Award.” Captain Ross will soon leave for his next duty assignment at Osan Air Base in South Korea. Daedalian Ric Lambart and 314th CO, Lt. Colonel Andrew Caggiano stand before the 314th’s fighting emblem. 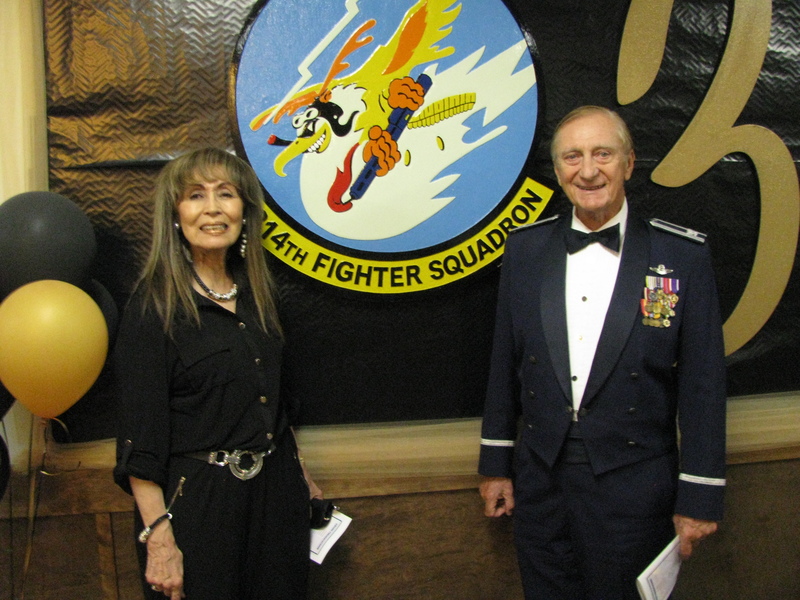 Julie Pitt and Colonel Bob Pitt also pose before the 314th Fighter Squadron’s battle Logo. This entry was posted in HOT NEWS! on June 30, 2016 by FASFRIC.